SIT TO STAND – There is no gear adjustment. The gas spring riser adjusts the pressure by itself. 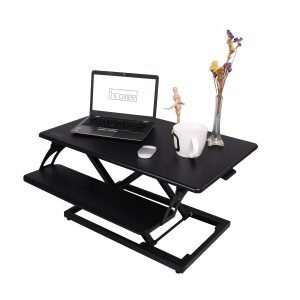 The converter lets you smoothly transition from between sit and stand position which provide comfortable experience to users. 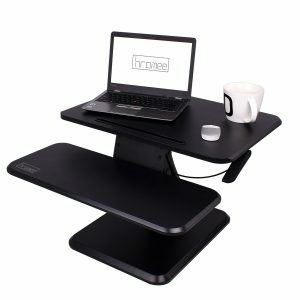 KEYBOARD TRAY & SLOT – Our standing desk comes with a keyboard tray which can hold a keyboard and a mice. There is a slot in the front of upper tier allows to put your pencil, phone and some little stuffs in case they will slip from the standing desk. SAFE & COMFORTABLE – The gas spring we used is tested by our designers and engineers for 50000 times to make sure the safety of users. The handle under the one side of the work surface ergonomic and easy to use for users. 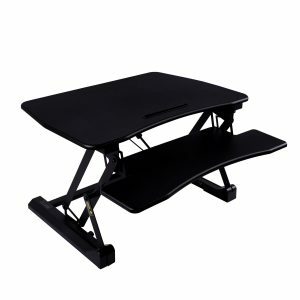 EASY TO USE – There is no need to install, you will get a pre-assembled desk when you get the package. All you have to do is set it on your current desktop and adjust to your preferred height according to your requirements in a few seconds. LARGE WORKING SPACE – The desktop is 20*31 inches which is large enough for single+dual monitors or laptop with monitor. So you can put your stuffs in this desk including the keyboard, mice, files and many books. 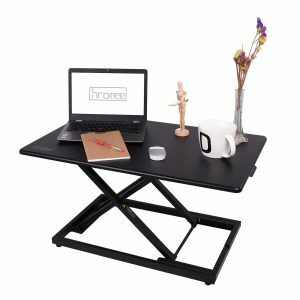 MATERIALS & DESIGN – The stand desk is made of iron and E0 high-density board Which is environment friendly and the max load is 33lbs. These materials provide the more sturdy and stable structure as well as the elegant decoration for your room or office. SAFE & COMFORTABLE – The gas spring of this desk is tested by our designers and engineers for 50000 times to make sure the safety of users. The handle under the surface is ergonomic and easy to use.